Tiny footprint, uniting elegance with an ergonomic handle. Tiny foot print, compact, lightweight and equipped with an ergonomic handle, the Inissia coffee machine fits perfectly into any interior design. Also available with Aeroccino Bundle. In just one touch and 25 seconds, the water reaches the ideal temperature to make up to 9 Grands Crus without having to refill the 0.7L tank. The machine features two cup sizes, espresso and lungo, and automatically shuts off after 9 minutes. 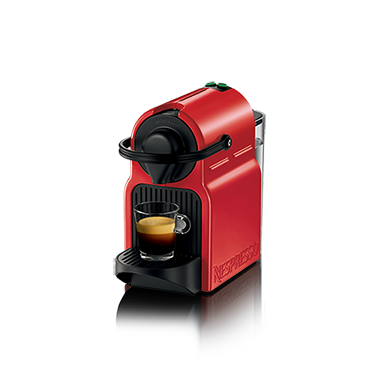 Nespresso Inissia Ruby Red Tiny footprint, uniting elegance with an ergonomic handle. Product #: C30-ME-MB-NE MYR 599 MYR599 In stock! Order now!